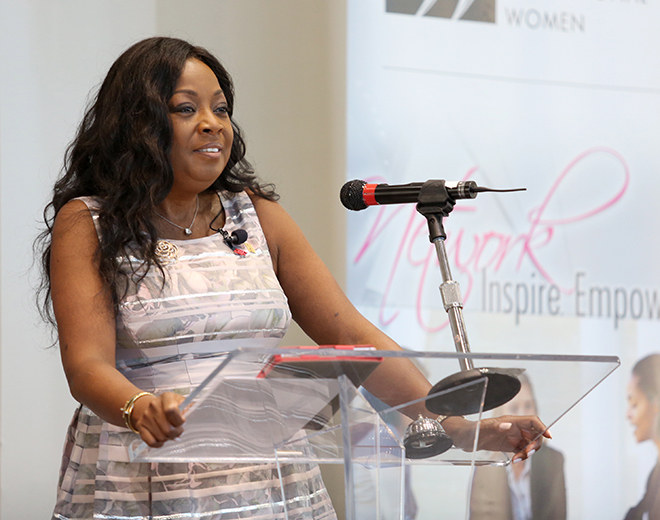 Star Jones '86, president of the National Association of Professional Women, hosted a Power Networking Event in partnership with the University of Houston Law Center on Tuesday. June 17, 2016 - University of Houston Law center alumna Star Jones '86 spoke of the need to uphold high moral standards in the legal profession, and the power of networking during a visit to Houston this week. Jones dined with Law Center Dean Leonard M. Baynes, Assistant Dean Marcilynn Burke, administrators, and alumni on Monday at Holley's Seafood Restaurant & Oyster Bar. She participated in a discussion with Baynes, where she spoke about her mentors, career highlights, and what she thinks are the biggest needs in legal education and the legal profession. "What I learned in law school that has been my model as an attorney, is to avoid the appearance of impropriety," Jones said. "I would do a disservice to those who came before me and those who would come after me if I did not act in an ethical way. I would love to see that impressed upon students in law school. "She is one of our most illustrious alums, and her career has traversed so many boundaries," Baynes said. "She has succeeded in so many different endeavors. We're very happy to have Star home where she belongs at the University of Houston Law Center." Jones '86, president of the National Association of Professional Women, is a former New York City prosecutor, TV journalist and one of the original co-hosts of ABC's "The View." Jones is also president of the Professional Diversity Network (NASDAQ: IPDN). NAPW is an exclusive network for professional women to interact, exchange ideas, advance their knowledge and empower each other. The NAPW has more than 200 local chapters 850,000 members. Jones emceed the National Association of Professional Women's "Power Networking Event," on Tuesday at the O'Quinn Great Hall in the University of Houston's Athletics/Alumni Center. "My legal education at the University of Houston's Law Center really is what controlled my trajectory throughout my entire professional career, and for that I am eternally grateful. There is absolutely nothing that I haven't been able to accomplish without my law degree." Jones encouraged the audience to be prepared, and maintain professionalism to get the most out of networking. "Number one, be ready for when the opportunity knocks on your door," she said. "When opportunity meets preparation, there's nothing that you can't do. Number two, pick up the phone. If a phone call comes, it could be an opportunity on the other end. Be careful of the feet you step on today, because they could be behind you tomorrow. I'm always nice to everybody that I've worked with and worked for, because they'll always come back." The Law Center-sponsored event was attended by women from a wide variety of industries, and included Q&A sessions with Associate Dean for Student Affairs Sondra Tennessee, and Dr. Victoria Ai Lihn Bryant, president of Ambassadors Caregivers. Tennessee urged attendees to pursue careers that they are passionate about. "Regardless of where you are in your graduation class ranking-wise, whether you're at the bottom or at the top, people are more successful if they have an idea of what they're interested in," Tennessee said. "Then you're able to target your very limited resource, which is time. If you say you'll "do anything," what is anything? There's not a job in anything, and you can't network in anything. If you at least have a target, then you will be in a space that you have some interest in." Prior to hosting the event, Jones offered advice to students in the Law Center's Pre-law Pipeline Program. "Education is power," Jones said. "The foundation of my success really came from learning how to be a strategic thinker at the University of Houston Law Center. Your law degree is your entrée to the world, and a tangible asset that you can use as a building block for whatever it is you want to do." Click here to watch the National Association of Professional Women's Power Networking Event at the University of Houston.